Many people look for a church full of ‘people like us’. But we think one of the blessings of genuine church is being united with people we might have nothing in common with – apart from the only thing that matters: a shared faith in Jesus Christ. At St Anne’s, there are likely to be a few people like you – but also lots of people older and wiser, or younger and more energetic. There will be people with very different life experiences to your own. Some of us will bless you by serving you; others will need you to serve us. There might be all sorts of things you’d like to find in a church. A particular style of music, architecture, liturgy or vibe. We all have our preferences. But we’re convinced that whatever our preferences, the Bible’s unchanging message about Jesus Christ, freshly proclaimed, needs to be at the centre of our loving community. So are you willing to try something different? Come and see why we love St Anne’s. Or get in touch with me if you want to talk things over. PS – If you’re already a member of a church, please don’t leave it without good reason. But if you are looking for a church, you might find this article helpful. The Christian message is simple but utterly life-changing. From the earliest times one of the ways Christians have summed it up is in the in the phrase: Jesus Christ is Lord. For example, Peter, one of the twelve followers appointed by Jesus to make him known, said: “… know for certain that God has made him both Lord and Christ, this Jesus…” (from the Bible, the book of Acts, chapter 2, verse 36). For a presentation of the Christian message in pictures, click here. For a fuller statement of what Christians believe, click here. Why not investigate the Christian faith by joining a Christianity Explored course? 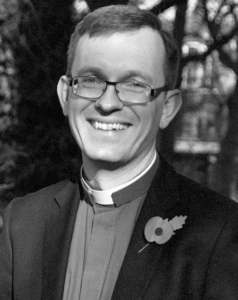 As an Anglican church, our beliefs are set out in the Bible, the Creeds and the Book of Common Prayer. Because we believe in the distinctive Biblical roles of men and women, we receive extended oversight from the Bishop of Maidstone. Please contact us if you would like to discuss our Christian convictions. St Anne’s was designed by Nicholas Hawksmoor and consecrated in 1730. It is Grade I listed and the churchyard and surrounding area is designated as a Conservation Area. For more on the history of the building please see our visitors leaflet here. The building has undergone 40 years of restoration so far to make it structurally sound and more appropriate for modern use. We are currently raising funds to install a lift to allow full access to all the main levels. We hope to complete the restoration of the nave within the next few years. For more on the restoration appeal and Care for St Anne’s, visit their page here. Our building is often used for filming, by orchestras, for children’s parties and in other ways. 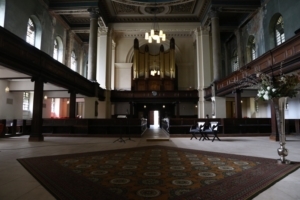 The crypt and main church building are both available for hire either together or separately. The crypt has toilet and kitchen facilities, and there is also a good-sized car park available for your use. Please contact us to discuss your particular event and availability. Our hire agreement is available here. Our bank details for payment of deposit and fees may be found here. St Anne’s does not receive a state subsidy or funding from the Church of England. We are reliant on the generosity of the regular congregation to pay our staff and for the upkeep of our historic building. For a short summary of our current financial situation click here. We encourage regular giving to be directed through the Parish Giving Scheme. Please ask for a form in church. One-off gifts may be made using gift aid here. 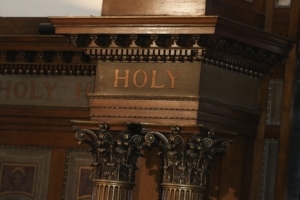 We have a separate fund for the ongoing work of restoring our beautiful Grade I listed Hawksmoor building. 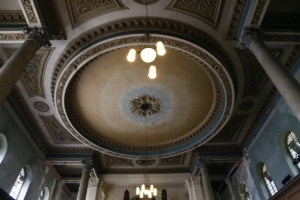 For details of our restoration appeal and lift fund, visit the Care for St Anne’s page here. We are very grateful for any gifts left to us in Wills, however large or small, and we promise to use these gifts to make a difference in our parish. Please see our PCC legacy policy for more information about leaving such a gift and how it might be used. Please e-mail our treasurer when making a transfer so that we can track payments. Gift aided donations may be made here. You can find out how St Anne’s processes personal data by reading our Privacy Notices below. If you have any further questions about how we use personal information please contact us. If you’re a member of St Anne’s church it would help us if you could update your contact details and preferences for receiving communications. Click below for an online form.